On the simple premise alone, this shouldn’t work: a movie about a board game? 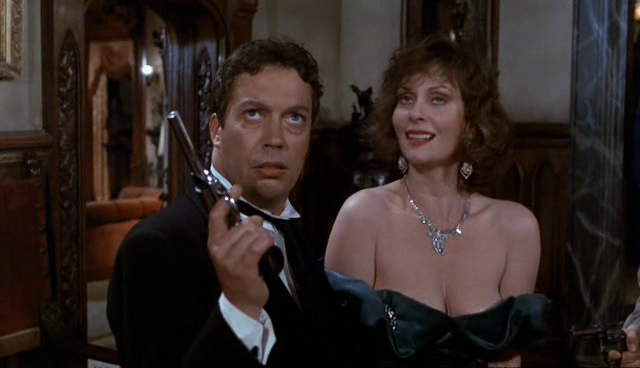 But this is 1985, when studios hadn’t realized how to make lots of money on a terrible movie based solely on marketing a familiar franchise – sure enough, Clue opened to mixed reviews and only broke even in the cash department. Instead, they made this movie the old-fashioned way: they hired a Brit who’d been writing for a popular comedy show to write and direct the film (Jonathan Lynn, Yes Minister), they found inspiration in the 1976 film Murder By Death, then a beautiful Gothic mansion set was constructed (later sold to Dynasty to use as the Carlton hotel), and finally they hired an amazing powerhouse cast of comedic talent to play all the colorfully named characters. The end result is a master class in slapstick, dry delivery, and proper punning. In other words, our beloved movie, Clue. The plot is a murder mystery – the details are important, but really only for the sake of jokes, which is what makes Clue infinitely quotable to those of us who love the film. So when we talk about Clue, we’re really talking about our favorite lines. Redlami is partial to Col. Mustard. Martin Mull’s droll sense of humor is used to great effect as part of this amazing cast. One of my favorite lines in the film is this exchange between Colonel Mustard (Mull) and Wadsworth (Tim Curry). Mustard: Are you trying to make me look stupid in front of the other guests? Wadsworth: You don’t need any help from me, sir. The more I’ve watched the film, the more I’ve also grown to love and appreciate Lesley Ann Warren as Miss Scarlett. "Who are you, Perry Mason?" Who hasn’t reenacted Madeline Kahn’s “flames. . . on the sides of my face . . . heaving, flaming. . .”? How else was I going to learn inflagranti delicto as a phrase when I was a teenager? I’ve held on to so many lines from that movie, and it would be embarrassing to blurt them out over dinner—who wants to hear about monkey’s brains while eating, anyway—except that everyone else knows and adores those lines as well. Eileen Brennan is the one of Snarky’s Machine’s favorites. 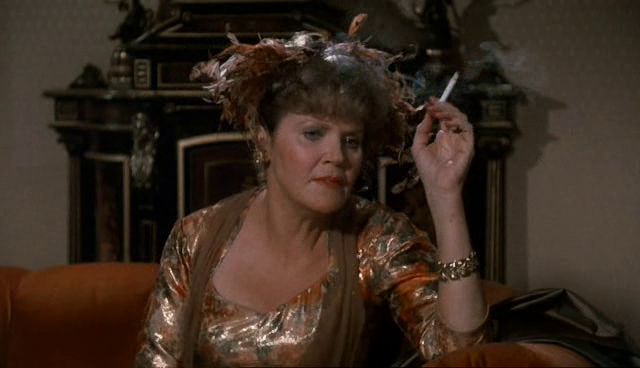 Eileen Brennan stole the show as Mrs. Peacock with her delightfully befuddled performance. 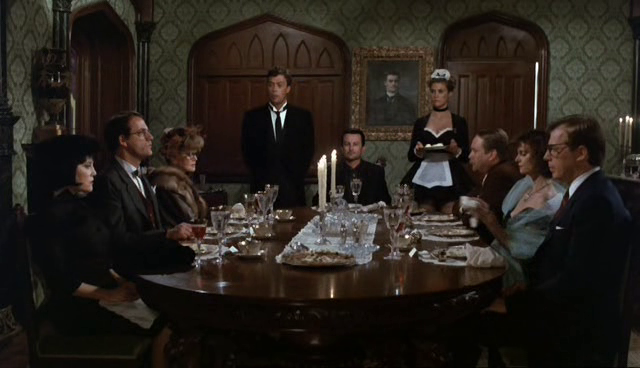 Mrs. Peacock gets some of the best lines, particularly my favorites – “Get your hands off me, I’m a Senator’s wife!” and “But look what happened to the cook!” Clue is an underrated comedic masterpiece, which makes great use of its deep roster of comedic talent. Of course, despite having seen the film eleventy billion times I’m still not sure if any of the “endings” are at all based in logic. Ah yes, the endings. When the movie was released in theaters, the gimmick was that there was 3 different endings and you didn’t know which one you would be getting. I’m sure they were hoping for repeat customers, but most people I knew were suspicious of the content that was hidden from them – what if another ending is better? What am I missing out on? They solved this problem when it came out on VHS (that’s basically what DVDs used to be called, kids) by putting all three endings together, the first two as possibilities, but the third is offered as the final solution. I wouldn’t normally be concerned with spoilers for a 1985 movie, but there is a certain pleasure in the surprise of one scene that was uniformly beloved by everyone who sent in their favorite characters, scenes, and lines from the movie. As Everett said, “it made me guffaw so hard I nearly lost consciousness. 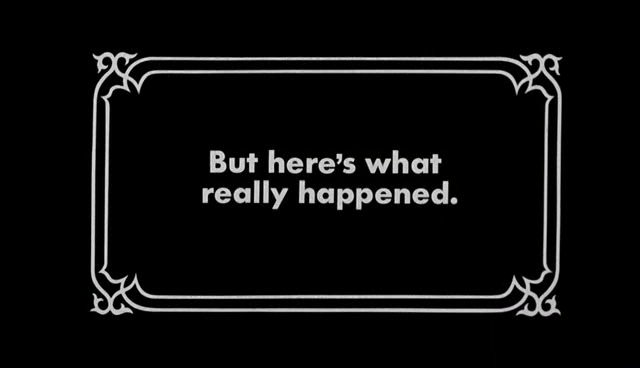 I had to pause our top-loading VCR and catch it again.” I initially wasn’t going to include it because I didn’t want to ruin the experience for people who hadn’t yet watched this comedy treasure, so if you haven’t seen the movie DON’T WATCH THIS. Trust me, it’ll be even funnier in context. In fact, it might not even be funny out of context. But for those of us who want to relive the joy, here we go! Now it’s your turn: what are YOUR favorite lines or scenes from the movie? There are lots of posted clips on youtube etc., so feel free to post them in the comments. Endnote: There is currently a remake of Clue in development, directed by Gore Verbinski and slated for a 2013 release, but we don’t like to talk about that around here. I accidentally first wrote “based on the classic film Murder By Numbers” and while Sandy Bullock probably got a ripple of pleasure out that sentence, I meant Murder by Death (and fixed the entry). I’m still laughing at this movie! One plus two plus two plus one, or one plus two plus one plus one…tremendous homage, Raymond! I totally have to get up and dance every time the end credits come on. I can’t help it. I want to buy the board game that’s based on the movie. I love those cards! “This is WARRRRR, Peacock!” I say this a lot for absolutely no reason. I also love everything about Christopher Lloyd’s performance as Professor Plum. He was brilliantly cast. Christopher Lloyd! I really could have written a dissertation, not just a blog post, but I was trying not to go too long. Mr. Green: I’m a plant. Col. Mustard: I thought men like you were usually called a fruit? This one can easily be misinterpreted in mixed company, but I say this line in regards to myself all the time. Fun fact: Lee Ving, aka Mr. Boddy owned the sleazy club Zanzibar in Flashdance!!! @Anie: Yes! I’m not shouting! Also, can I give a tip of the hat to the hilarious music that played when the gang ran from one room to another? Loved it. I know, because I was there! I only recently discovered the IMDB “goofs” page for this film, which definitely added to my enjoyment in re-screening it. Of course with a film this goofy it’s hard to know which goofs were truly unintentional, but that’s all part of the fun! I am determined to enjoy myself. All this nostalgia is making me want to watch again! @Redlami: [from the IMDB goof page] None of this would have been possible considering the fire burning in the fireplace would have sufficiently illuminated the entire room. omg, how did I never notice the biggest one of them all??!? I’ve noticed objects appearing and re-appearing, because I tend to catch continuity things like that, but damn, that one made me crack up laughing at having never thought of it while watching. This is next up in Netflix, oh yeah! As soon as I saw the title for this entry I thought “FLAMES…FLAMES ON THE SIDE OF MY FACE!” and started giggling before I even got there in the text. Awesome write up, and a fantastic film! Oh my, this soup’s delicious. Seriously, great write-up! It makes me sad to know that it took me until I was 23 to find someone other than my mother who loved this movie, but that person is one of my best friends, and we have exposed countless people to this movie over the years, so that kinda makes up for it. Miss Scarlet: Sure, I’ll eat anything. 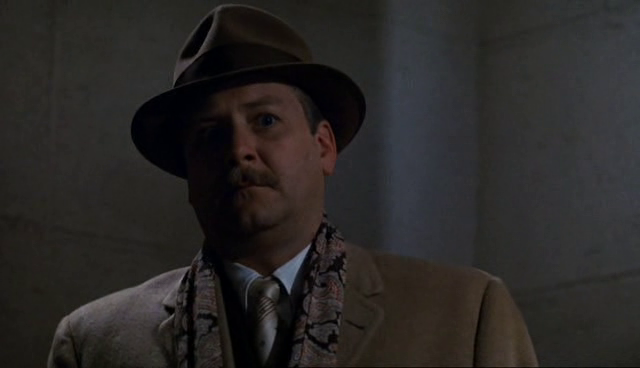 I love how Mr. Green says, “Now I’m going home to sleep with my WIFE.” It’s just a funny goofy line. Mostly because its punctuated by “Shake Rattle and Roll”. Great post! Yes, let’s please pretend the remake isn’t happening. Clue was one of my first favorite movies as a kid. I remember the last movie ending blowing my mind with its zaniness and creativity. Its so funny how the singing telegram moment sticks with everyone who watches it. It’s the second thing I think of after the “flames on the side of my face” quote (which IMDB says Kahn improvised). Clue’s the kind of movie you have warm, nostalgic memories of, and then when you watch it again, still holds up and then some. It’s true, I feel like every time I watched it, I got a joke I’d missed before! Some because I was laughing and didn’t hear them, some because I was pretty young when it came out, so I had to grow into them. There was a point in Summer 2007 where Clue was the only thing I’d watch ON REPEAT for nearly a week. it never stopped being funny, entertaining and engaging. Maddie Kahn (RIP) FTW! Mrs. White: He wasn’t a very good illusionist. Maybe it’s just me, but I’ve always preferred the jokes in ‘Murder By Death’, that and the zany send-up of all the famous sleuths. Maybe it depends on which movie you watched first as to which one you prefer? If folks want to compare for themselves, I noticed today that Murder By Death is available on netflix-instant. I find the jokes in MbD not as funny as Clue, but I like it a lot. And monkey’s brains, though popular in Cantonese cuisine, are not often to be found in WASHINGTON, DC! Also, this movie gets much love from me for Johnny Fever‘s appearance in the final reel. Delurking to say that the cards are from the VCR Clue game (of which there were at least 2). Sadly the games were not as classic as the movie, but I watched them over and over as a kid. A small theater company in San Francisco recently turned Clue into a play, with the stage being a giant game board. They remained very faithful to the script. It was great, not as a good as the movie, but damn close. Hell, they even performed all three endings. @mamacarrie: thank you for solving that mystery! I will keep an eye out for that video version now in second-hand stores…. @C, that sounds like a lot of fun, I kinda wish i’d thought of it. Perhaps someday I will open my own community center, just so I can be in it. Also, thanks for all your comments lately; welcome to the fun, it’s great to have you here! I love this movie! I think it was very entertaining and t cast was excellent. One of my favorite scenes is when everyone is searching the house and professor plum and mrs. Peacock were going to look in the basement. It’s just a great, funny movie that hardly anyone seemed to talk about or recommend to me, and yet after finding it on my own by chance, I honestly can’t get enough. I’ve watched it many times as well and it never seems to get boring for me, the jokes perhaps even funnier than the last time. Everyone does a great job, and it’s just so much more than you would expect from a movie based on a simple board game. I didn’t know that the endings were a surprise as you describe to the audiences in the theater; that’s actually a great gimmick to pull given the nature of how the game worked.